Ghana international Christian Atsu is eager to force his way into the Bournemouth side and impress both his loan club and his parent club Chelsea. The 23-year-old winger is yet to play in the Premier League this season for the Cherries, in what is his third loan spell since joining Chelsea in 2013. "It's my dream to play for Chelsea. But right now I have to focus on Bournemouth," he told BBC Sport. "If I don't play here, there is no way I will get a chance at Chelsea." Ghana's Christian Atsu is focussing on Bournemouth so he can fulfil his dream of playing for parent club Chelsea. 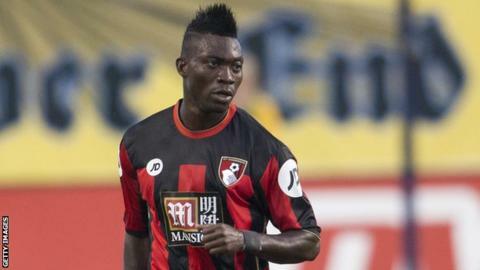 Since completing a transfer to Chelsea in September 2013, Atsu has been sent to Dutch side Vitesse Arnhem, Everton - where he made five Premier League appearances - and now Bournemouth. "Of course I'm not happy I'm not playing in the Premier League because I came here to play," added Atsu. "Going out on loan is very difficult. You have to keep moving and taking your family with you and that is not easy. But that is the life, and you have to accept it. "I'm settling in well at Bournemouth, everything is step by step but things are good with my life and my family." As well as the disruption to his personal life, Atsu has had to battle back from an injury picked up in pre-season that kept him out of the start of the campaign. He finally made his Bournemouth debut in the Capital One Cup win over Hartlepool on 25 August. "I was very happy to play in that game and to make my return from injury," he said. "The fans were great to me that night and I thank them for their support. "With my fitness I am getting better and right now I am ready to play many games."